Mary and Rob Zip for Cats! 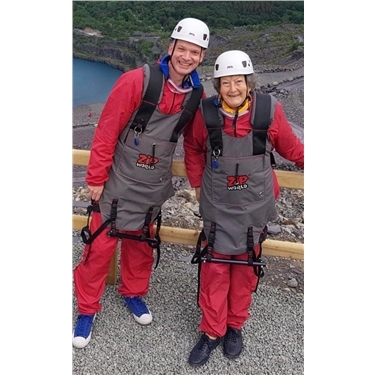 Huge well done to Mary and Rob for completing the zip wire on Saturday 2nd June to raise funds for cats and kittens in North Wales!! Mary turned 80 in January 2018 and decided to celebrate this with a sponsored event for our Colwyn branch of Cats Protection. She has dedicated many years to our branch as coordinator amongst many other roles and continues to foster for us and works hard to promote neutering of feral cats. Rob is our Regional Development Manager, our go to person from Cats Protection HQ who oversees a number of branches in the North West and Midlands. You can still sponsor Mary on her Just Giving page to help us help more cats in North Wales.